Bird Life Abounds, let nature introduce you to Clarendon magic. 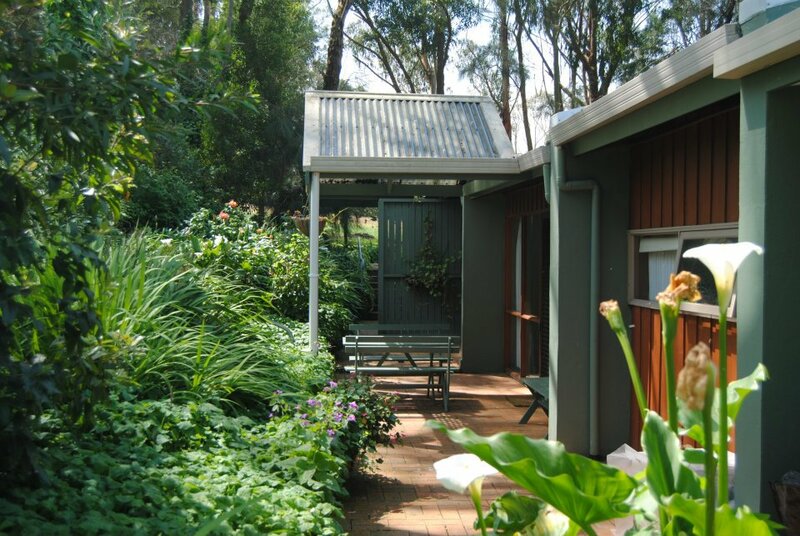 A spectacular driveway lined with tall blue gums brings you to Clarendon Chalets. They are nestled at the bottom of a three acre garden and decorated to reflect charm and elegance. Fully self contained, three with spa baths, private courtyards, timber kitchen, TV, wood fire, reverse cycle air conditioning, free wireless internet, BBQ, hair dryer, DVD player, fully equipped shared laundry, children’s cubby house. A short leisurely walk or bicycle ride to the hilltop past the neighboring winery. Breathe in the cool country air and enjoy the panoramic view of rich farmland tapestry and green hills rolling to the beautiful Mount Gambier, a city of lakes, limestone caves, gardens and pine forests. Cosy, yet spacious, the Chalet is a restored artist/potters studio with lofty timber ceilings. Set on 15 acres in a unique farmland environment. Private and secluded romantic hideaway, and only 300 metre walk to the famous Barn Steakhouse. There are five chalets operational. They are all fully self-contained with private bathroom facilities. Included is a continental breakfast or, for a small fee, provisions for a hearty farm style breakfast of bacon, eggs & tomato. Don’t worry about linen, crockery or hair dryer as it is all supplied. Take a short drive to Port MacDonnell, renowned for it's crayfish, or watch the sea mist roll in off the Great Southern Ocean at Nelson. Observe abundant bird life, flora and fauna while picnicking at a BBQ area on the banks for the Glenelg River in the national park or tour our world class Coonawarra wineries. Relax on your private patio and watch the sun set behind the towering sugar and ghost gums and enjoy the magic of Clarendon. Deposits are non-refundable. The owner reserves the right to issue a partial refund of the deposit after the booking date if cancelled and only if the booking is taken up by another party. A cancellation fee of the total amount of the booking will be charged if a booking is cancelled with less than 24 hours notice. For stays more than 2 days the cancellation fee is half the amount of the total booking.